The OM-CP-PRTEMP140 is a high temperature and pressure data logger all in one, created specifically for use in autoclave validation, mapping studies and pressurized processes. 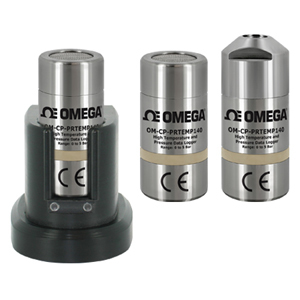 Featuring the familiar body style of the OM-CP-HITEMP140 Series of data loggers and made of rugged stainless steel, this dual purpose device is less than 64 mm (2.5") in length, allowing it to fit discretely inside small spaces. The OM-CP-PRTEMP140 data logger downloads temperature and pressure data simultaneously and displays the combined results in a single graph, simplifying data collection and analysis and eliminating unnecessary steps for the user. This data logger is able to measure and record temperatures from -20 to 140°C (-4 to 284°F), and pressure from 0 bar to 5 bar, accommodating a wide range of applications even in the harshest conditions. The memory capacity on the OM-CP-PRTEMP140 stores up to 32,700 time and date stamped readings and will retain data even if the battery becomes discharged. The OM-CP-PRTEMP140 utilizes the latest software, making the entire process from starting the device to analyzing data, efficient and easy for the user. Downloaded data can be viewed in various formats including graphic and tabular and can also be exported to Excel® for further analysis and calculations. 참고: Comes complete with 3.6V lithium battery. Operator’s manual and USB interface cable are included with the OM-CP-IFC400 software/cable package (required for data logger operation, sold separately).